When Jennifer was 51 her husband became gravely ill and as he recovered she decided to do something she’d always wanted to do but had put off, a triathlon. The only problem was, she couldn’t swim more than 10 metres, run properly, or ride a bike. Her journey towards becoming an entrepreneur really started in that moment, when she decided to stop waiting for life to happen. At the time, Jennifer was entrenched in corporate culture as the CEO of an Australian health service, but she and her husband packed up, sold their house and moved to Brisbane so she could make the leap into entrepreneurship. A corporate refugee after more than 35 years in public health in executive roles I set up my own business called Fit n Fifty Plus. I am passionate about helping women get fit and healthy so they can fully participate in their life. I have a Masters of Science with a background in cardiology. I am a certified Wellness coach and a whole lot of other things. There was very little information, support, guidance and advice for women my age (to train for a triathlon). This massive void of discovery opened in front me. Women are left behind when it comes to caring for heart health. We spend a lot of money on breast cancer and breast health but Cardiovascular disease kills more women than breast cancer, by far. And it also is much more debilitating. It’s not that hard to look after yourself. You just need to understand what you are doing. I wished I hadn’t left it so late. I wished I’d been brave enough to do it 20 years ago because it takes a lot of courage but there were so many social constructs that stopped me or that I thought stopped me. It is quite a lonely journey establishing your own business. When I was a CEO I’d ask for something to be done and it would get done. Now, when I ask a company to do something, they may or may not do it particularly in IT. It’s because you’re not the boss anymore, that’s the trouble. That’s been a big learning for me. If you are freelancing, why aren’t you treating your customers like they’re the boss? Being an older woman as well I find there’s a bit of agism and sexism when you’re dealing with organisations. You need to look past the person and get to the issue of what they need. Our message to women on White Ribbon Day: Don’t minimise any kind of violence if it’s happening to you. That includes intimidation, power and control, manipulation and not just physical violence. Reach out and seek help because that’s where physical violence begins. Jennifer shared that her own personal experiences in life influenced her to not do the things she wanted to do when she felt she should have. I can really understand the barriers that are there for women at this age to make changes at home. If your self esteem is not in tact, it’s really easy to go with the flow and not put yourself first. It’s not about being selfish in a bad way, it’s about being selfish in a good way. Your health’s important to everyone around you. Look after yourself. It doesn’t have to cost money. Knowing first, being mindful and actioning small things at a time. James Schramko – If you want life to be different change something. We tend to think: If we want to change something, change everything and that’s overwhelming. Once you start to make little changes, then you’ll start to feel better and you’re more likely to make the bigger changes after that. When you go out, think about what you’re going to eat and drink ahead of time. When you get there always have a glass of water before you do anything at all. Always stand as far as you can away from a buffet. Be mindful. Think about what you’re doing all the time. If it’s important to you not to eat badly, then think about it. Alcohol is everywhere. They portray women as successful and beautiful if they have a glass of wine in their hand. The perception is to be a successful 50+ woman, you are skinny, you have lovely coifed hair, usually blonde and you have a drink in your hand. It’s replaced the cigarette in my opinion. Jennifer’s making the leap tip: Make sure you have a bit of money behind you. For the first six months you need to work on your business without worrying about money. If you enjoyed the show, I’d love for you to leave a rating and review on iTunes. It only takes a moment and your review and rating of the show can really help this show reach more listeners. 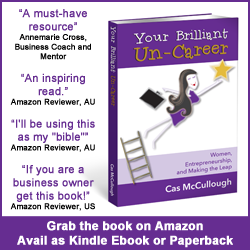 Chapter 1 of Your Brilliant Un-Career talks about finding your purpose. I have done a terrific interview with Y Network founder and author Shar Moore on this topic that I want you to have. Access this interview for free here, along with 32 other business building podcast interviews, templates, worksheets and motivational affirmations.